Just about a year ago John Sadler was celebrating Accelerate's victory in the Santa Anita Handicap, the trainer's first ever in the track's historic race. Now he is poised to win it again with Gift Box, who worked six furlongs Friday in 1:14 for the mile and a quarter classic next Saturday, March 9. 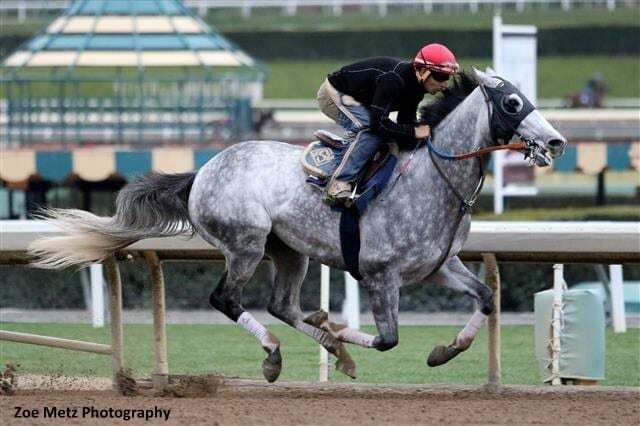 “He looked good, went out in 27 (1:27 for seven furlongs),” Sadler said of the gray son of Twirling Candy formerly trained by Chad Brown. “We had to move his work up a day because of the rain, but we got the work in, so I'm happy. Gift Box won the Grade II San Antonio Stakes Dec. 26 in his first start for Sadler, who conditions the five-year-old full horse for principal clients Kosta and Peter Hronis. Should Sadler win the Big Cap two years in a row, he would join the distinguished company of seven other trainers who have accomplished the feat: Bob Baffert (Game On Dude, 2013 and 2014); Doug O'Neill (Lava Man, 2006 and 2007); Bobby Frankel (Milwaukee Brew, 2002 and 2003); Richard Mandella (Siphon and Malek, 1997 and 1998); Charlie Whittingham (Lord At War and Greinton, 1985 and 1986); Ron McAnally (John Henry, 1981 and 1982); and Tom Smith (Kayak II and Seabiscuit, 1939 and 1940). Joel Rosario, who rode the gray son of Twirling Candy to his half-length score at 6-1 in the San Antonio, will be back aboard for the Big Cap. Fans will be treated to five stakes Saturday, greatest interest focusing on the Grade II, $500,000 San Felipe Stakes expected to match Bob Baffert's two leading undefeated Triple Crown contenders, champion Game Winner and Improbable in the Grade II test offering 50 Kentucky Derby qualifying points to the winner. Additionally, the prestigious Frank E. Kilroe Mile with Grade I status will be showcased on turf; the Grade II San Carlos Stakes will attract sprint stars going seven furlongs; and for good measure, three-year-old fillies will vie in the $75,000 China Doll Stakes at a mile on grass. First post time on Big 'Cap Day will be 12 noon. This entry was posted in NL List, Racing and tagged accelerate, big 'cap, Chad Brown, gift box, joel rosario, john sadler, kosta and peter hronis, santa anita, santa anita handicap, Twirling Candy by Ed Golden/Santa Anita. Bookmark the permalink.